Quick, get it before they change the price!! 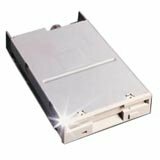 Save $236.60 on your next FLOPPY DRIVE! Now the question for Amazon is, where do the disks go? you simply load a blank CD-R or CD-RW, put on your LP, press "record," lower the tone arm, and press "play." You can record the entire album or simply pull select favorites from your entire collection to make your own unique compilations. 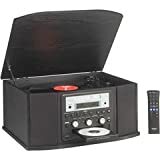 It has an AM/FM Radio, and a turntable for playing 45s or Lps....... 45s and Lps...WTF is THAT? !